Registration and payment of deposit is a prerequisite for ALL attending. Registrations are on a first-come, first-served basis. Registrations are NOT confirmed until registration fees are received. Online payment is available this year. See further registration information throughout this web site. After registering, if you find AT ANY TIME that you will NOT be able to attend, PLEASE contact Registration IMMEDIATELY. There is a waiting list of people who can take your place when we are informed. The fee charged by the university, shown below, covers linens, meals and use of facilities provided by the University. These costs and additional expenses (love gifts, equipment and vehicle rental, craft supplies, etc.) will be paid for by love offerings during the Conference. Each attendee is encouraged to seek the Lord earnestly for their personal financial provision to cover the cost of attending the conference. It is a concern that recently a number have attended the conference and made little or no financial contribution. This is a poor testimony to the Provider who has promised to meet all our needs. Please pray earnestly for your personal financial responsibility. If after supplication you feel you still have a financial need, first take it up with your local assembly. Finally, you may contact Conference Finances noted below. Maximum registrants-800 (600 on-campus and 200 off-campus). You must be registered and pay the registration deposit to attend (on and off-campus). Register promptly. Registration is limited based on available space in children's classes, dormitories, and the auditorium. Registrations will be accepted on a first-come, first-served basis until all available spaces are filled. If your registration arrives after the limit is reached, you will be informed and your fee returned. Please inform us of cancellations immediately. Cancellations made after June 1, will not have the Registration Fee refunded. Those registering for full time, on-campus (4 or more days) will receive priority over part time and off-campus registrants. The preferred method of registration is online via this web site. To register online click here and follow the instructions. Register online by clicking here and fill out the ENTIRE Registration Form. All information requested is pertinent to the conference and your immediate registration is contingent upon a COMPLETE Registration Form. Check all appropriate information and make notations where necessary. The Registration Fee is $50.00 per person for age 3 years and up, or $150.00 maximum per family. This Registration Fee can be applied toward your total conference fees (see Conference Fees). Checks are payable to Christian Family Conference. If registering online you may pay your registration deposit online with a credit card. When registering online and not paying with a credit card you must mail a check for $50.00 per person for age 3 years and up, or $150.00 maximum per family. 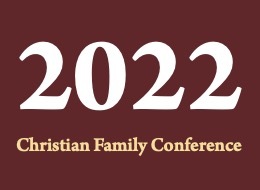 Checks are payable to Christian Family Conference. Please write your registration ID number, which is given during the registration process, in the memo field of the check. If sending a check, mail the deposit check immediately. You will not be registered until we receive the deposit. Your registration is NOT transferable to another person if you cancel. All cancellations must be handled through Conference Registration. Please notify Conference Registration of any cancellation as soon as possible up until the day the conference begins. If you have registered and must cancel, your Registration Fee will be refunded upon written request if made prior to the June 1th deadline. All registrants under 18 years MUST be registered with a parent or guardian who is attending the conference (List guardian and the name and address of the registrant's parents in Special Information on the registration Form. All registrations for childern under 18 years of age must include the grade the just completed.